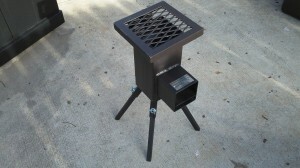 New sponsor Deadwood Stove Company sent me one of their cook stoves for evaluation. 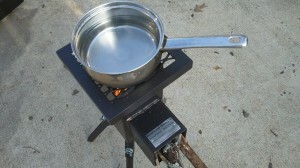 For the prepper – this type of technology fits the bill for off-grid cooking. 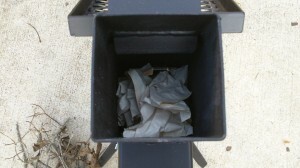 The Deadwood stove arrived in a taped up box. Unpackaged – I found the contents included the main body of the stove, a full color owners manual, 4 black metal legs and a pair of work gloves. Like every other man – I tossed the manual to the side and proceeded to assemble the stove. 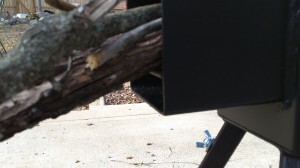 Each leg slid into its holder and then remained securely with the twist of included wing-nuts. In no time the stove was assembled. Looking over the stove I was very impressed with the fit and finish. Workmanship appears top notch. Welds look good and everything is straight and true. I really like the hinged grated top that easily moves out of the way to access the main cooking cavity. Also – the stove came with a really nice identification plate with the company’s name and the stoves individual serial number. 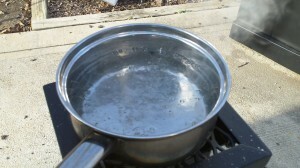 To give the stove a try – I decided to try to boil some water which would represent preparing most any meal as well as….well….. boiling water. I inserted some paper that I had laying around as well as several small dry twigs. 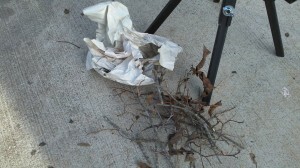 I also gathered up some additional small twigs as well as several other small to medium sized sticks. Knowing how these stoves work – I knew I would need additional fuel nearby. I lit the paper with a single match and it caught. As the paper burned the smaller twigs began to catch fire and I tossed in some more small sticks as well. 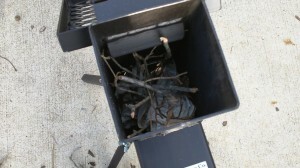 Within a few minutes I inserted some larger sticks into the bottom chamber as the smaller sticks and twigs were burning. 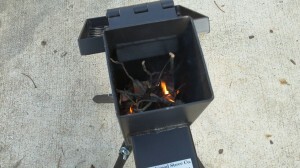 At this point the larger sticks began to burn so I placed my pot of water on top of the metal grid. This stove works by feeding a fire in the lower cavity – and the heat exiting the top creates an air flow through the bottom chamber – which feeds the fire. As the tips of the sticks which hang out of the lower opening burn – a simple push every couple of minutes on the sticks provide fresh, dry fuel to keep the fire going. The amount of heat generated by the stove can be controlled by the amount and type of fuel. I had no problem bringing the pot of water to a full rolling boil. It took 8 minutes once I felt comfortable that the wood-fuel was burning consistently. I have used stoves like this before and found this one to have some very positive attributes. The metal grate at the top which lifts out of the way via hinges is a great improvement. The grate also provides a larger surface which to hold pots and pans. The four legs provide great stability and overall this thing is rugged. 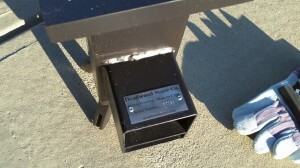 For more information – click visit the Deadwood Stove website. What about ash removal? Is there an opening or do you need to turn the thing upside down and shake out the ash between uses? Sure – the opening which you place wood to keep the stove fueled can be used to empty the ashes as well as turning it upside down. Put a lid on it! The pot I mean, 🙂 it’ll conserve energy and get your water boiling faster! Dude offer 5 cooking plates with this .and I’ll help you sell them.